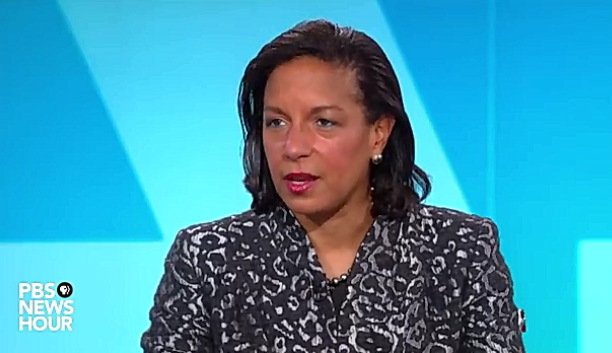 That was former National Security Advisor Susan Rice on MSNBC on April 4 openly admitting that she had in fact been involved in requesting the “unmasking” of the identities of U.S. persons who were caught in intercepts of foreign persons under surveillance. This confirmed at least partially the April 3 report by Bloomberg View’s Eli Lake that Rice had “requested the identities of U.S. persons in raw intelligence reports on dozens of occasions that connect to the Donald Trump transition and campaign,” citing the accounts of U.S. officials. It is hard to explain the seeming contradiction without simply concluding that Rice was lying in her March 22 interview. The “unmasking” of the Trump transition in supposed foreign intercepts was not yet public knowledge, and so in a public interview she felt confident in denying any knowledge that Trump transition officials had been swept up in surveillance activities, even though she knew she had personally participated in the effort to reveal their identities. How did she know which intercepts to unmask, one wonders? But perhaps the reason why Rice didn’t think she was doing anything wrong, in unmasking the identities of the Trump officials via foreign surveillance, and then initially lying about it, is because in her eyes, this sort of thing happens all the time. Here Rice was referring to circumstances regulated by USSID 18, rules promulgated for collection, retention and then dissemination of foreign intelligence gathered to and from U.S. persons. Note, these unmasking procedures of a U.S. person’s communications intercepted in the collection of foreign intelligence require no separate warrant, raising serious constitutional concerns about whether the Fourth Amendment’s prohibition against unreasonable searches is being followed. These authorities granted to intelligence agencies, if they are to have any legitimacy whatsoever, must be only used in addressing threats to national security and when they involve U.S. persons be handled with the utmost care. One does not need to look far to find examples where political figures have been tarnished in newspapers with turning up in foreign intelligence surveillance. The case of former U.S. Rep. Jane Harman (D-Calif.) comes to mind, who on April 20, 2009 wound up in a New York Times story has having been unmasked during the Bush administration in the course of a 2005 counterintelligence investigation against employees of the American Israel Public Affairs Committee. At the time of the surveillance, Harman was the Ranking Member of the House intelligence committee. Why was Harman’s identity being revealed four years after the fact? The Times story cited “current and former government officials” as sources. Another example everyone will be familiar with is the outing of surveillance of the identity then-incoming National Security Advisor Michael Flynn Jan. 12 in the Washington Post. Flynn had been swept up in a conversation with Russian Ambassador Sergey Kislyak on Dec. 29, 2016. He was unmasked and then that information was used publicly against him to create the appearance of being a foreign agent. There was Attorney General Jeff Sessions, whose own meeting with Kislyak in his Senate office was revealed by Justice Department officials in a March 1 Washington Post report. Was this more incidental unmasking? A more recent example is one-time Trump campaign worker Carter Page, who on April 11 was revealed in the Washington Post to have actively surveilled by the Obama administration using a Foreign Intelligence Surveillance Act (FISA) court order. Although slightly different from the “unmasking” procedures above — this did have a warrant — FISA court orders are nonetheless classified. Their being revealed is a serious crime. Yet another example came a day before the election, reported by Louise Mensch in Heat Street on Nov. 7, 2016, that computer servers connected to Trump Tower had been surveilled under a FISA court order for suspicion of carrying on some sort of foreign transactions with some Russian bank. No charges were ever brought. This was the story that eventually led to President Donald Trump’s tweet accusing former President Barack Obama of spying on Trump Tower. Later it was revealed by Circa.com reporters Sara Carter and John Solomon on March 8 that indeed the servers connected to Trump Tower had been surveilled with a FISA court order, but that no criminal wrongdoing had reportedly been found. As an aside, how is it possible that Trump’s computers could be surveilled but when the DNC computer servers were supposedly hacked by Russian government spies nobody could get surveillance or a warrant on the servers there to confirm there was even a hack? Leaving that aside, it appears all these figures — none of whom have been charged with any crimes thus far — were victims of surveillance being used for political ends to create the appearance that these individuals were foreign agents of some sort. Even if any of them are later charged with something, it would not justify their identities being revealed in this manner, which can only be viewed politically. In the case of Heat Street, the intent was obviously to influence the elections, to create the appearance of foreign collusion even if there was none. These disclosures were all apparent violations of 18 U.S.C. Section 798, which prohibits “knowingly and willfully communicat[ing] … or otherwise mak[ing] available to an unauthorized person, or publish[ing] … any classified information … obtained by the processes of communication intelligence from the communications of any foreign government…” And they are being committed with impunity, all to advance a political agenda. But we shouldn’t be surprised. Not only does this sort of thing apparently happen a lot, it has a long history that must be addressed. This all harkens back to the worst fears of the Church Committee, which was convened in 1975 to get to the bottom of revelations by Seymour Hersh’s explosive report to the New York Times on Dec. 22, 1974 that the CIA had been engaged a mass, domestic surveillance program against anti-war protestors, members of Congress and other political figures. It is hard not to worry that, after the revelations of the past weeks, months and years of Edward Snowden revealing the mass NSA surveillance and even Wikileaks more recent disclosures on CIA hacking tools, and now the political use of surveillance recently, that we have not entered the very abyss Church presciently foresaw. You don’t choose the war, the war chooses you. President Trump and Congressional investigators may not have set out to take apart this ubiquitous surveillance state, but they should well consider the long-term consequences if they do not.